SpaceX‘s proposal to build a temporary Dragon spacecraft processing and refurbishment facility at Cape Canaveral Air Force Station in Florida has secured approval from the state’s environmental regulatory agency, Florida Today reported Friday. 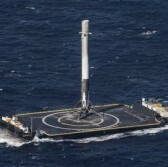 Florida Today obtained permitting documents that say the St. Johns River Water Management District has given SpaceX authorization to make changes to Landing Zone 1 at the Cape Canaveral installation. The company also plans to construct a static test fire stand near the future Dragon facility to test the space vehicle’s launch abort system that will work to move the spacecraft and astronauts to safety in case of an emergency. SpaceX and Boeing won contracts worth up to $6.8 billion combined in September 2014 to transport astronauts to and from the International Space Station as part of NASA‘s Commercial Crew Program. NASA awarded both companies four additional missions each in January 2017.